The Particle System module contains global properties that affect the overall system. The main module is expanded by clicking the white icon button to the right of the inspector window. The name of the module will appear in the inspector as the name of the GameObject that the Particle System component is attached to. Duration The length of time the system will run. Looping If enabled, the system will start again at the end of its duration time and continue to repeat the cycle. Prewarm If enabled, the system will be initialized as though it had already completed a full cycle (only works if Looping is also enabled). Start Delay 시스템이 활성화된 후 방출을 시작하기까지 기다리는 지연 시간(초)입니다. Start Lifetime 파티클의 초기 수명입니다. Start Speed 해당 방향으로 작용하는 파티클 초기 속도입니다. 3D Start Size Enable this if you want to control the size of each axis seperately. Start Size 각 파티클의 초기 크기입니다. 3D Start Rotation Enable this if you want to control the rotation of each axis seperately. Start Rotation 각 파티클의 초기 회전 각도입니다. Randomize Rotation Direction 일부 파티클이 반대 방향으로 회전하도록 합니다. Start Color 각 파티클의 초기 컬러입니다. Gravity Modifier 물리 관리자에서 설정된 중력 값을 스케일합니다. 이 값을 0으로 하면 중력 효과가 해제됩니다. Simulation Space Toggles whether particles are animated in the parent object’s local space (therefore moving with the parent object) or in the world space. Scaling Mode Use the scale from the transform. Set to Hierarchy, Local or Shape. Local applies only the particle system transform scale. Shape mode applies only the scale to the start position of the particles. Play on Awake If enabled, the particle system starts automatically when the object is created. Max Particles The maximum number of particles in the system at once. Older particles will be removed when the limit is reached. The system emits particles for a specific duration, and can be set to emit continuously using the Looped property. This allows you to set particles to be emitted intermittently or continuously; for example an object may emit smoke in short puffs or in a steady stream. The “Start” properties (lifetime, speed, size, rotation and color) specify the state of a particle on emission. You can specify a particle’s width, height and depth independently, using the 3D Start Size property (see Non-uniform particle scaling, below). 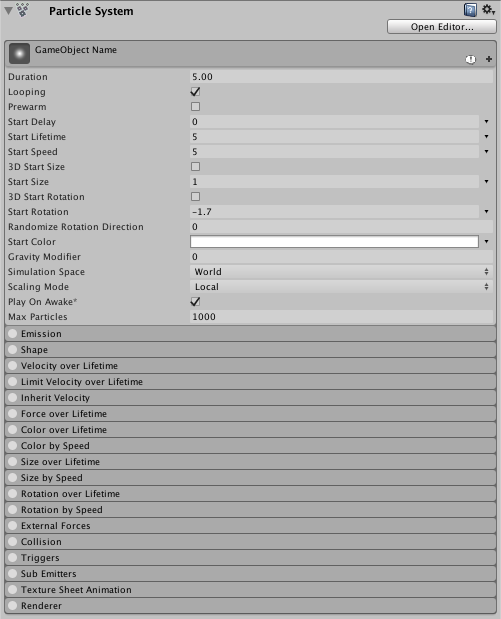 The Inherit Velocity and Simulation Space properties together determine whether the particles move with the Particle System parent object or independently in the game world. For example, systems like clouds, hoses and flamethrowers will need to be set independently of their parent object, as they tend to leave trails that persist in the world space even if the object producing them moves around. On the other hand, if particles are used to create a spark between two electrodes, the particles should move along with the parent object. The 3D Start Size property allows you to specify a particle’s width, height and depth independently. In the Particle System main module, check the 3D Start Size checkbox, and enter the values for the initial X (width), Y (height) and Z (depth) of the particle. Note that Z (depth) only applies to 3D mesh particles. You can also set randomised values for these properties, in a range between two constants or curves.